This creamy, silky, perfectly sweet Swiss meringue buttercream is a breeze to make and is the BEST thing ever to decorate with. It pipes and smoothes beautifully! When you want a light, creamy, smooth buttercream there are two choices, Swiss or Italian buttercream. I love both but have to admit there is less less chance of burning myself when making the Swiss variety as you’re gently heating the meringue over a double boiler. The other benefit of these buttercreams is the color; you can get a very bright white with them and not have to resort to covering your cake in fondant. What’s the difference between Swiss and Italian meringue buttercream? Both are meringue based frostings that use egg whites to create a lightness and silky structure perfect for decorating. Italian buttercream uses 240F sugar syrup poured into the fluffed egg whites to stabilize the meringue while to make Swiss buttercream you gently heat the egg and sugar mixture to 160F using the steam heat of a double boiler. I find Italian meringue buttercream to be just a bit stiffer than Swiss but bother are EXTREMELY creamy. Lets talk about a couple potential problems. I think the most common issue is related to adding the butter when the meringue is still too warm. If you don’t wait long enough then the mixture will be soupy, which is a bummer. Luckily you can pop the bowl into the freezer for a few minutes, then give it a whip and it should be right as rain. If your start using the buttercream and it has lots of little bubbles and isn’t silky and pliable then it’s been sitting for a bit too long. All you need to do is give it a 5 second whisk and it will wake back up and regain it’s consistency. If you want to make the buttercream ahead of time, it can be refrigerated for a few days. Make sure to store in a sealed container, preferably a sealable plastic bag you can squeeze the air out of. Once you’re ready to use it, allow it come to room temperature and give it a short “whip” to restore the consistency. Does Swiss meringue buttercream melt? Swiss meringue buttercream will melt in the heat. It you’re piping buttercream flowers and expect the temperatures to rise I recommend using a thicker American buttercream. Can you over whip Swiss meringue buttercream? Unlike a mascarpone based frosting tor pure meringue, Swiss meringue buttercream cannot be over-whipped. Don’t let any yolks get into your whites when you separate the eggs. The easiest avoid yolks is to separate the eggs one at a time into separate bowls and then pour the white in as you go along. Don’t get scared when you add the butter in! if it’s a soup or if it’s looking wonky just chill is a few minutes then get back to mixing. If your idea of warm is tepid then go ahead and use a thermometer to see when your egg white mixture has reached 160F. Carefully separate the egg whites into a bowl. Add the sugar and salt, then give the mixture a brief whisk to incorporate everything. Place the bowl over a pan of simmering water. Make sure the water does not touch the bowl. Whisk the egg whites occasionally while it warms up. When the mixture has warmed, whisk it constantly. Heat the mixture until it reaches an internal temperature of 160 degrees F or until it’s not grainy between your fingers, then transfer it to a stand mixer. Mix with a whisk attachment until you get room temperature glossy peaks. Once it gets to that point, switch to a paddle attachment. While the mixture is running on low, add tablespoon sized dollops of room temperature butter. Make sure to let each piece of butter incorporate before you add the next. When all the butter is mixed in, scrape the bottom of the bowl down; there is always some meringue hiding down below! Go ahead and add the vanilla extract and give it one last mix. 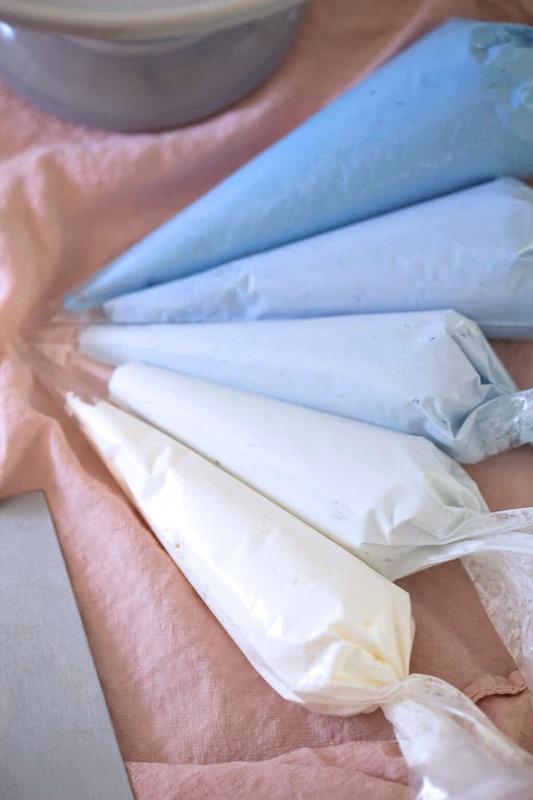 You can transfer it to a piping bag or a ziplock bag to store in the freezer. If you’ve tried this buttercream then don’t forget to rate the recipe and let me know how you got on in the comments below, I love hearing from you! 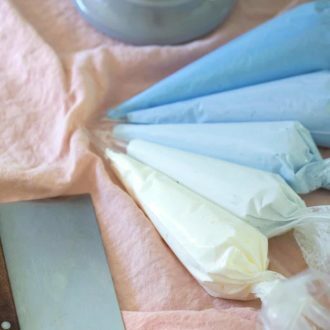 A step-by-step guide to making silky Swiss buttercream. 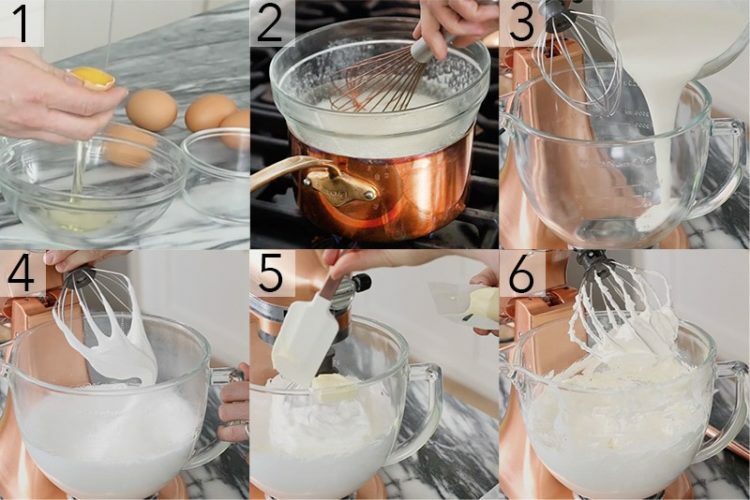 Transfer the bowl to a stand mixer, mix with a whisk attachment until you get room temperature glossy peaks. Switch to a paddle attachment and while the mixture is running on low, add tablespoon sized dollops of room temperature butter making sure to let the butter incorporate before you add the next piece. Once all the butter is incorporated, go ahead and add the vanilla extract. You can transfer it to a piping bag or to a ziplock bag to store in the freezer. To reactivate the buttercream after it has been frozen, allow it to come to room temperature then whip it. If you start adding butter and the mixture becomes soupy don't panic!!! It will be soupy until ALL the butter has been added. I add flavorings at the end, especially if I'm making a batch of chocolate SMBC, where there's a considerable amount of liquid going in. It would be stable but SOFT. So things might get droopy fast in hot weather. At what stage do you add the meringue powder? Does it completely dissolve so that there is no graininess? How would flavorings be added? Add in flavors during the last step! Can this be used for piping flowers? Is it stiff enough? Absolutely. The egg whites hold their shape and I think it is better to pipe with. So I was so excited to make this, but my frosting is just a big bowl of liquid! What happened? Can I fix it? Try sticking it in the fridge for 10 minutes, then give it a whip. Make sure you added all of the butter in! I hope that your meringue was the right temperature! This happens if you used boxed egg whites/pre-separated that come refrigerated, as it’s the only time my eggs didn’t whip up. If you are using them, you’ll need to add cream of tartar. I think I had to google the amount to add per egg/batch of frosting. If it turned to liquid AFTER the butter, then let it cool before whipping on high speed again. It’ll come together. Oh dear, I think I missed something. Should I have whipped the meringue when I first put it into the mixer until stiff and then added the butter? The meringue shouldn’t be stiff and fluffy before you transfer to the mixer! Sounds like you’re on the right track! The butter will give the mixture body! Can you leave Swiss meringue buttercream out at room temperature for a few days?? It’s fine over night at room temperature, just cover it! I would try to use it as soon as possible! Hope that helps! Hello. Would you please have the weight in grams not cups ? Just updated the recipe! Hope you enjoy! You mention to paddle mixture but image shows a whip (step 5). Which is appropriate? Thanks. Appreciate your site. Use a paddle attachment for this step! I took a photo with a whisk in this step, but it should be a paddle! You use the whisk in the video, too. So the paddle is better for this step? What about the final whip? I guess a lot of air needs to be incorporated in the mixture, for which the whisk is better. I usually switch to a paddle but either works fine to be honest. How many cups of frosting does this recipe make? Not sure about the exact amount, but I filled 5 large piping bags with the batch! Hope you enjoy! The recipe says to use right away or freeze, but no mention of refrigeration. How about popping it in the fridge for say, 3 days? Do I just need to get it to room temp and whip it up again before piping? Thanks! You’re right! Storing the buttercream in the fridge for 3 days it absolutely fine. Make sure it’s airtight. When you’re ready to use it, leave it on the counter to come to room temp and give it a quick whip before piping! Hope that helps! I refrigerated mine and after I took it out and let it come to room temp. I whipped it up and it started to fall apart. It became watery, and looked like curttled milk and butter if that makes any sense. What am I doing wrong? At what stage can you add flavorings, coloring’s in? I do it at the end but you can add the flavorings right after the butter goes in! Hi John! Just discovered your page and I love your recipes! I’m trying to make the flowers in your piping tutorial. Did you use Italian or Swiss buttercream for that? What are the texture/taste differences between the two kinds of buttercream? I would use American buttercream for the flowers. 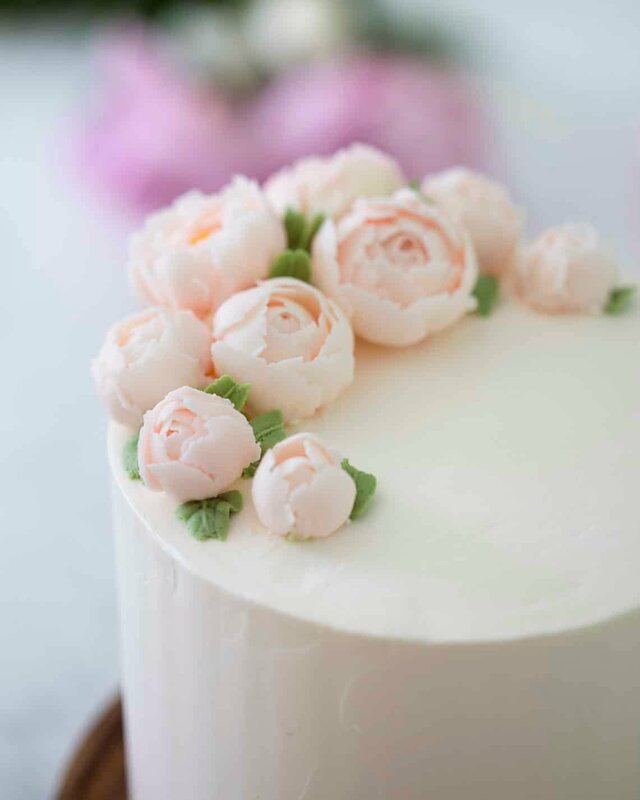 Thats what I use because it has a thicker texture so it’s perfect for piping flowers! About how many cupcakes would this Swiss Meringue Buttercream frost? Hi John, Thank you! My daughter and I just made your Swiss Buttercream and it is absolutely delicious. How do we store the decorated cake? I’m happy you made this buttercream together! How long are you planing on keeping the cake? A frosted cake can be kept at room temperature for 4-5 days covered. If you are trying to keep it longer, I would chill the cake for about 15 minutes to harden the frosting, then wrap it up in plastic wrap. When it comes to stacking three layers of cake, will the Swiss Meringue Buttercream be stable enough? Or should I go with the American Buttercream. Thanks for all the tips, tricks, and recipes! It can be, it depends on the cake. What cake are you thinking of making?? I’m planning on baking your chocolate cake recipe (one tier, three layers), but I’d like to make a Nutella buttercream. I feel that the American buttercream would be too sweet. That is very nice to hear!! I’m so happy you have found, made, and enjoyed this Swiss buttercream! 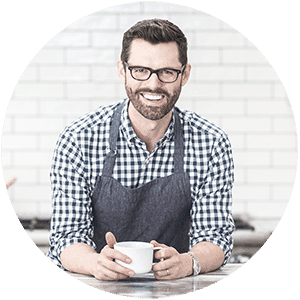 Thank you for supporting Preppy Kitchen! Yes you cna use that frosting and maybe add an extra 1/3 or 1/2 cup of sugar in. I like my frostings less sweet but I know some people want that sugar hit! Hi! I am inloved of your work, the colors, the presentation, the video!! All I love it!! Just a little detail, in the section of the servings we can modify the quantity of cups and eggs, but do not the grames. I made this buttercream and was so impressed with myself that I got it right the first time. I used this to make your Christmas cupcakes and they turned out awesome. The buttercream cream was so silky and smooth. And pipes beautifully. Thank you so this awesome recipe and the blog!! I was thinking of infusing lavender into my buttercream. Any suggestions for how to do this? Maybe adding the flowers while the egg mixture is heating up then strain it? Thanks so much for sharing! I would recommend using lavender oil (food grade) and 1 tsp of vanilla extract. You’ll want to add them in once all of the butter is incorporated. Can you use liquid egg whites for this? Amazing recipes always. This is the recipe I always use! I am making a vegan version of this recipe with Aquafaba. My question is: Do you think vegetable shortening only would still hold up in this recipe? I’m so curious to find out! I want to make some more vegan recipes this year, been so behind! Awesome will let you know. Have you ever done a shortening only version? Ok I have been avoiding making this because well I really don’t know just scare I guess. However I followed your directions to a t and it turned out great. I am making a strawberry cake for a baby shower tomorrow. I am adding strawberry syrup to the Swiss buttercream. You are so correct it is very creamy and dreamy. Thank you soooo much I am going to try the other buttercream from you also. P.s it did come out yellow but if you add a toothpick with just a dot of violet to the mixture it will turn white. I sent you a reply abou two days ago but I don’t see it so I will try again. I was so scared to make this recipe for the longest but I followed your instructions and it came out just as you said creamy/dreamy. It did turn out somewhat yellow but a trick to make it turn white is to put a dot (and I mean a toothpick dot) in the entire patch whip it and it will turn white. I flavored it with strawberry extract and syrup to go with a strawberry cake. OMG it was a hit for the baby shower. Thank you so much.